The Africa Center for Strategic Studies in collaboration with the U.S. Embassy, Dag Hammarskjöld Institute for Peace and Conflict Studies (DHIPS) and the Africa Center Zambia Community hosted a Topical Outreach Program Series (TOPS) Symposium in Lusaka, Zambia, on March 25–27, 2014. Three separate symposia were held: the first, held on March 25, discussed the African Union (AU) architecture and emerging patterns of insecurity in the Southern African Development Community (SADC); the second, conducted on March 26, focused on national security and security sector reform; and the third, held on March 27, discussed collaboration between the military and police in security sector reform. 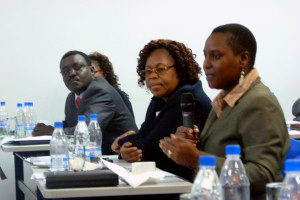 Each of these seminars brought together about 60 mid- to senior-level military, civilian and police professionals from the Ministries of Defense and Foreign Affairs, Zambian Army, Air force, Zambia National Service and Zambia Police, Professionals from United Nations agencies, academia, and non-governmental organizations. The seminar on the African Union, which was held at the U.S. Embassy in Lusaka, examined the evolution of the African Union Peace and Security Architecture (APSA) and SADC’s role in it. Dr. Njunga-Michael Mulikita, a Senior Lecturer at the Dag Hammarskjöld Institute for Peace and Conflict Studies (DHIPS), traced the development of the Southern African Peace and Security Architecture to the 1992 Windhoek Treaty establishing the Southern African Development Community to replace the Southern African Development Coordination Conference (SADCC), a regional initiative established in 1980 to reduce the economic dependence of the newly independent states in the region on apartheid South Africa as part of a broader decolonization strategy. SADC, according to Dr. Mulikita, is the most peaceful and developed region in Africa with a comprehensive set of peace and security protocols, institutions and agreements. The SADC Organ for Politics, Defense and Security (OPDS), established in 1992, is the region’s link to the African Union Peace and Security Architecture (APSA). The community has established several institutions including an Early Warning System (EWS) in Gabarone, Botswana, the SADC Parliamentary Forum, in Windhoek, Namibia, the Regional Peacekeeping Training Center (RPTC) in Harare, Zimbabwe, and more recently the SADC Standby Brigade. Nevertheless, Dr. Mulikita observed, the community faces several challenges including tension between member states, resource deficits, social discontent and poor coordination between regional security mechanisms. Dr. Mulikita also cited several institutional weaknesses; the failure of the Early Warning System (EWS) to warn about impending conflicts; the lack of effective response mechanisms; the lack of a security sector reform (SSR) policy framework; and the lack of a mediation unit to facilitate dialogue between conflicting parties. He urged the AU and SADC to put more emphasis on institutional development and strengthening and the inclusion of civil society in the region’s peace and security activities. In the seminar on national security strategy held at the Mulungushi Conference Center in Lusaka, His Excellency Edgar Lungu, the Zambian Minister of Defense, announced that the Government would hold a referendum on the country’s new constitution to make the process as consultative as possible. “We will have ample time to go through the draft constitution and when we complete the process we will be guided by what the citizens’ want, if they want a referendum we will go with that even though it is an expensive venture to undertake,” he said. Ambassador Royson Mukwena, the Dean of the School of Social Sciences and Director of Research and Postgraduate Studies at Mulungushi University in Kabwe, Zambia, observed that Zambia, like many African countries, does not have a consolidated national security strategy. “No single document,” he argued, “can be referred to as Zambia’s definitive national security strategy. … The country’s actual strategy is scattered in several legal, constitutional and policy documents.” Ambassador Mukwena however revealed that Zambia is considering embarking on a process leading to the adoption of the country’s first official national security strategy. He identified the following threats to Zambia’s national security: high levels of poverty, economic underdevelopment, high unemployment, organized crime and corruption. Institutions with national security responsibilities include: the Zambia Defense Force (ZDF), Zambia Police, Zambia Security and Intelligence Service (ZSIS) and other institutions including the Anti Corruption Commission (ACC). Prof. Owen Sichone, the Director of the Dag Hammarskjöld Institute, stressed that citizens’ security and state security are inseparable from the full and free exercise by citizens of their civic and human rights. He urged Zambian security sector professionals to operate within the confines of the constitution and respect citizens’ civic and human rights. Because many of Zambia’s national security challenges are economic in nature, a viable national security strategy, in his view, has to be based on a framework of good governance and improved service delivery. Speaking at the symposium on security sector reform (SSR), on March 26, Mr. Thomas Dempsey, Assistant Professor and Academic Chair for Security Studies at the Africa Center, noted that the focus of national security was shifting from regime survival and state security to human security. He identified several core competencies for the military and police on 27 March. The core competencies for the military are: countering military threats, expeditionary capabilities, and developing rapid and scalable responses. Those for the police are: community presence, arresting authorities, limited and appropriate use of force and international as well as regional cooperation. Shared functions between the two include intelligence and information gathering and analysis. Putting these competencies into effect, according to Mr. Dempsey, requires the development a whole-of-government national and human security process that enables effective military and police collaboration and planning. A highlight of the three-day program was the creation of the Africa Center Zambia Chapter, the result of several months of work by the Africa Center Zambia Community, U.S. Embassy, Ministries of Foreign Affairs and Defense and the Dag Hammarskjöld Institute for Peace and Conflict Studies (DHIP). The Chapter, which brings the number of Africa Center Chapters in Africa to 33, will be embedded in the DHIPS. It brings together Africa Center alumni from the Zambian general staff and command including several in senior leadership positions in the Army, Air Force and National Service as well as security sector professionals from civil society and academia. The Zambia Chapter is highly organized, motivated, and populated with experts in security strategy and challenges. The Topical Outreach Program Series (TOPS) is the Africa Center’s instrument for providing close support to African partners through rigorous and structured engagement with alumni.